For the Chris Bell for Texas Senate campaign in 2008, WilCharMedia developed an online media strategy that called for publishing and broadcasting on multiple platforms and connecting them in smart ways. We had just two weeks to design and begin building the Website before the campaign launched on July 20, so the online presence became a continually evolving and expanding project. Using the Drupal content management system, we created a dynamic Web site capable of displaying news, photos, audio and video. We used an Acquia Drupal 6 installation that was most capable of evolving and growing to meet the campaign's rapidly changing needs. The site also incorporated multiple blogs for the candidate, his wife and key staffers, along with a simple but versatile calendar that campaign staffers could post to, using text, images, video and audio. We used Drupal's powerful taxonomy feature to "pre-build" areas of focus that later would become instant special sections, such as this Education Section that includes audio, video, text and speeches from the candidate about education issues and concerns. Behind the scenes, we also optimized and tagged-up every article and blog post to make it easily findable by Google's search engine. Often, Google picked up our stories and blog posts hours ahead of pieces that appeared on the Websites of mainstream media organizations and their blogs. We featured many contribution campaigns on the Web site, and each of them sent contributors through to ActBlue, so the campaign could take advantage of those tools, rather than have to reinvent that e-commerce wheel. You can see Bell's ActBlue page and the more than two dozen donation campaigns here. For e-mail alerts, we initially sent people from ChrisBell.com to the NGP Software's system, because the candidate had used it before and it contained a vast database of names. Subsequently, we set up a much more dynamic and flexible e-mail alert and volunteer database, which is described below in the Women for Bell section. 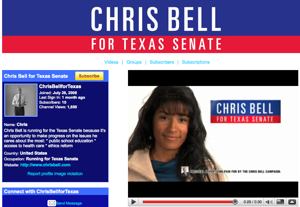 We also created the Chris Bell for Texas YouTube channel even before he launched the campaign. He announced his candidacy on YouTube hours ahead of his formal speech and headquarters kickoff. Between July 20 and early December, the campaign team produced 14 videos, which gathered about 5,000 combined pageviews on YouTube. Bell also had an Utterli audio channel ready on the first day. Through Utterli, his announcement speech was recorded, digitized, posted to the Website and distributed minutes after he spoke. Utterli was our audio channel of choice for important announcements and interviews throughout the campaign. For example, Bell's personal aide, Jon Ryan Parker captured several pieces of audio, including the former President Bill Clinton's speech at a Bell fundraiser. All told, the audio got nearly 7,000 pageviews from people who chose to click and listen. We created a "political candidate page" (which is no longer public) and used it widely to announce events including block-walking or fundraisers. We also used the page to announce new videos and to republish blog posts. Supporters also used the page to post photos of themselves with the candidate and to "tag" him in pictures from memorable moments. On Election Day, Nov. 4 and again on the night of the runoff election, Dec. 16, we live streamed video on a Kyte.TV channel that went through the Bell Twitter page and up to Facebook as a status update. The results were fabulous, as supporters commented on his Facebook status and engaged in the conversation. We created the Twitter channel, ChrisBellNews, hoping that supporters would understand the posts were not being done by the candidate, and we tried to make that clear when people interacted. At the time we created the account, very few Texas politicians were Twittering. The channel became an important vantage point during Hurricane Ike, when many people in the candidate's District 17 -- which spans the Texas Gulf Coast from Houston to the Texas-Lousianna border -- were deeply affected by storm damage. Twitter also was an exceptionally good broadcast vehicle on both election nights, for get-out-the-vote, asking for re-Tweets of "please vote" and for announcing and posting live video. We used a Nokia N95 cell phone equipped with a stereo microphone, to shoot and stream live video to the Web on Election Night and on the night of the runoff vote. The link to the video was posted on Bell's Twitter, which relayed the link to his Facebook as a status update. The video was also embedded real-time on chrisbell.com, so it broadcast to a potential audience of nearly 5,000 friends and supporters. We also made it easily embeddable so it could be quickly picked up and published by other bloggers. We only produced five shows on Kyte.tv, but they gathered nearly 6,000 combined pageviews. This video on election night was posted to the candidate's Website and to his Twitter and Facebook page at about 8:30 p.m., so it broadcast hours ahead of the nightly news. Midway through the brief runoff period of the campaign (from Nov. 5 to Dec. 16, 2008) we developed and created a separate Web presence for women supporters, Women for Bell. We designed a special splash page for the campaign, and incorporated a custom sign-up/feedback page that created a dynamic Google spreadsheet with several columns of information. Because time was so short, we added a special "alert" feature to instantly notify key Bell staff members by email every time a new volunteer signed up to help. The Women for Bell Web presence generated a network of help from dozens of new, enthusiastic supporters quickly and at relatively low cost. At the outset of the campaign, we set up a special Chris Bell photo pool on the photo-sharing site, Flickr, to encourage supporters to upload and tag photos. We used the photos from the pool in several ways, including on the ChrisBell.com home page as sidebars. Eventually, we also set up separate accounts for staffers so they could pool the photos for use on chrisbell.com and for use in the Google Maps mashup. We were the only campaign in Texas to offer interactive Google maps showing every early voting location, as this Early Voting Guide shows. As anyone can see on the expanded version of this map, it has to date, received a stunning 24,000 page views.